The rudiments of piety were meditation, young and yajna.But with the advent of kali Yuga, temples and images constitutions became a part of worship. 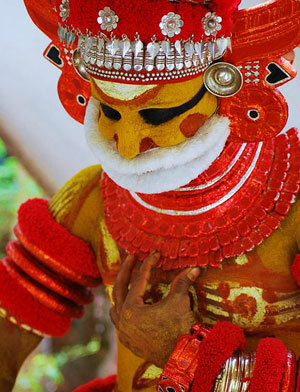 Theyyam can be envisaged as a symbol of Dravidian Culture that existed in kerala prior to the Aryan culture.Theyyam or Kolam worship is a subtier mode of worship than idolatry.Theyyam is the quintessence of all that we conceive of God in our mind. The devotes who ,while standing with moist eyes before Theyyam marking mind.Theyyam has now become a part of faith for all irrespective of religion, caste or clime which is a pivotal change from times o yore when it was constrained by each community as their own set Gods and Goddeses.Sree Muthappan stands prominent among such Gods. 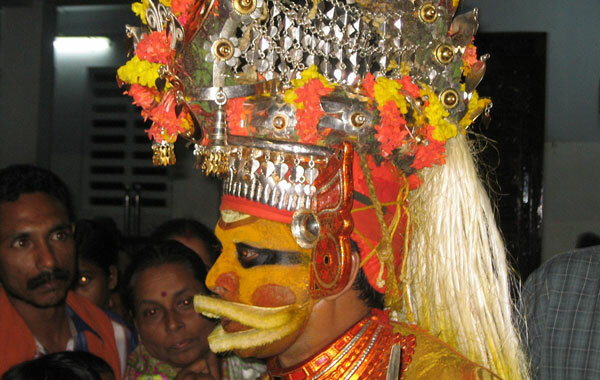 Muthappan is the incarnation of Lord Vishnu and Siva born in the period of Kali Yuga. Muthappan is the incarnation of Lord Vishnu and Siva born in the period of Kali Yuga.Muthappan is known under varied names like Thiruvappana, Vellatam, Cheriya Muthappan, Valiya Muthappan, Ambala Muthappan, Puralimala Muthappan etc. 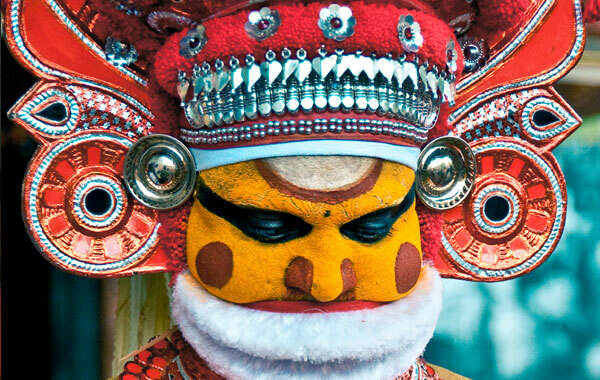 The history and legacy of Muthappan tell the spiritual and socio-cultural ethos of the period he was part of. 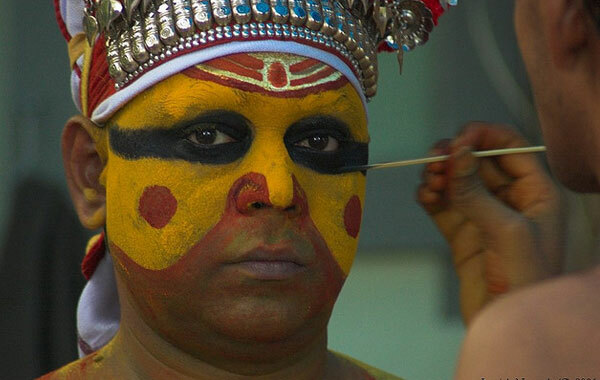 The history of Sree Muthappan finds no place in he legends or epics of yore. Like Lord Ayyappa, Muthappan also has a separate legend and incarnation theory. 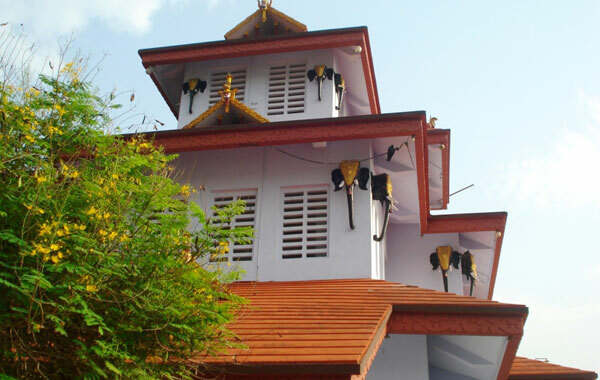 With the dominion of Aryans over Dravidians in the Parusuram created Kerala, the temples and properties and even the right to worship had been appropriated by the community of Brahimns.The low-caste people as well as the backward were relegated and distanced from temple duties. The life of the working class people ,the subalterns and the poor and needy became strained with the observance of Feudal System, slavery and untouchability.Legand has it that Sree Muthappan was born in such a context reminiscing one the lines from the Bhagavat Gita(Sambhavami yuge yuge). He was there for the liberation of such down trodden people mentioned early. 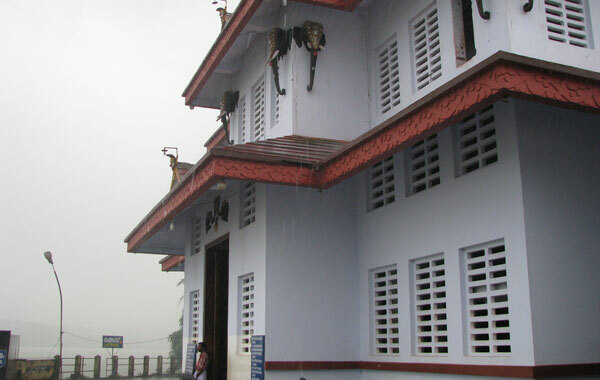 The Couple Ayyankara Devan and Padikutty anthrajan of the famous Ayyankara Illam of North Malabar had been living in aject sorrow and agony due to their having had no child long years after their marriage. As usual Padikutty and her maid servants enter for the royal bath at Tiruvan Kadavu.Hardly had she made a dip when, rising up, she heard the cy of an infant. A very handsome baby was sighted playing about on a flat stone when she made another dip. The child was sighted playing about on a flat stone hen she made another dip. The child was carried along with great affection to Ayyankara Illam. He grew up at Ayyankara Illam as the darling of the Ayyankara couple. The child got as boon was taught Vedas and Epics and as per acharya norms was converted to a Brahmin following the ritualistic pattern called ‘upanayanam’. But when the child grew up he started showing Super human powers. It become usual for him to make company with lo-caste people and to invite them to the illam. The sanctity and purity of the illam was demolished by him when he hunted wild animals and brought the booty to the illam to cook and eat them. The sanctity and purity of the illam was demolished by him when he hunted wild animals and brought the booty to the illam was demolished by him when he hunted wild animals and brought the booty to the illam to cook and eat them. He was admonished and brought the booty to the illam to cook and eat them. He was admonished and when Ayyankara Devan reached the nadir of patience it was decide to send him out of the illam for good. 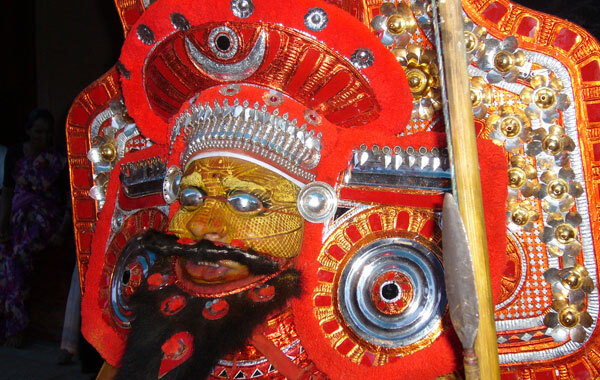 When Muthappan looked around all the vegetation around got burned in the fire of his warth. When Muthappan directed his looks at father,the mother pleaded to the son telling ‘Nay’ dear son,’closing his eyes by her hand.’ Wear a gentler look with ‘Vellikunnu’ shedding your ‘Trikkanu’, sid the mother. (The man who wears the mantle of Valiya Muthappan wears the mantle of Valiya Muthappan wears this ‘velliknnu’as a a token of This incident). With bow and arrow as mighty weapon, Muthappan with his entourage set off to the forest with a great pack of hunting dogs. They reached the pinnacle of a hill called Kunnathur paddi.One day Muthappan climbed up apalm and stole and drank some toddy. Enraged at this ,Chandan took his bow and narrow and attacked Muthappan.Muthappan looked at him with his divine eyes and his acolyte immediately turned into a stone.Chandan,s wife got nervous at her husband not returning after doing his work of cutting grass. Searching her husband friend wide, she reched under the palm tree to see the stultified Chandan in his human shape. Looking up at the palm tree to see the stultified Chandan in his human shape. Looking up at the palm she saw a great man of grace with divine light emanating around his head. She let out a wild cry calling,’Oh, my Muthappa…’.She vowed to him that she would get back her husband in human shape an image. The word ‘Muthappan’ was first pronounced by his low-caste devotee. 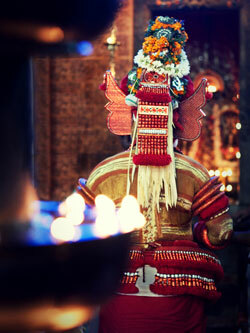 The offerings given to Muthappan in all ‘Madappuras’ are what had been mentioned early. It was to Puralimala that Muthappan went straight from Kunnathur Padi.Muthappan continued his triumphant journey organizing the poor and downtrodden against the hegemony of the Brahmins. He crossed swords with the Ottawa King who had ben ruling paralegal and defeated him and annexed his land where he built 308 Madappuras and innumerable podikkalams thereby reinforcing his dominion over the king. He pillaged several barn houses and distributed the grains to the poor. Revolting against untouchability and isolationisam, he not only organized the Harijans, Vannans, Thiyyas and Angolans but made them perform many ritualistic duties as well. He summoned the high caste Brahmins to witness the event and sought their blessings to sow the seeds of a spiritual revolution. 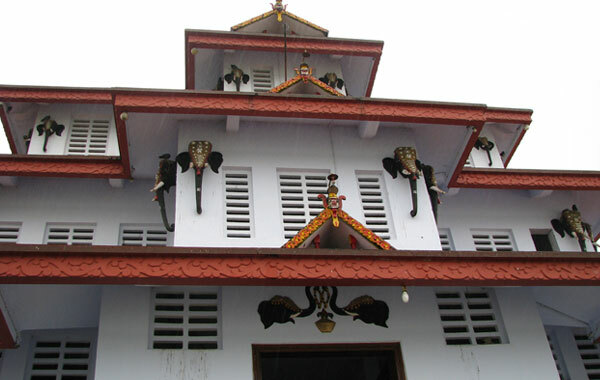 The worshipping place of Muthappan is called Madappura.Many Madappuras are there in North Malabar .Of all such Madappuras; Parassani Madappura is the most prominent. Here Muthappan devotees of Muthappan who throng here being supplied with Tea, steamed pear and a small piece of coconut. Relief and consaltion is accorded to all devotees of Muthappan who come here and conolation is accorded to all devotees of Muthappan who come here and after the lighting of the lamp called Deeparadhana.Devotees are blessed with the ‘Holy Darsan’ by both Cheriya Muthappan and Valiya Muthappan when they conduct Thirivappana Vellattom in the wee hours of morning.